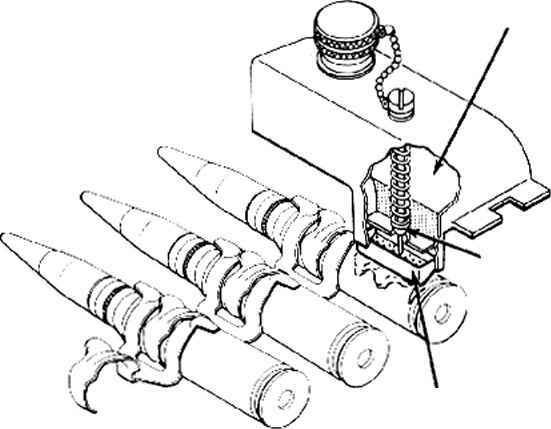 While the bolt and gun are moving forward, the bolt motion is influenced by the force of the bolt driving spring, but the gun motion is influenced by both the force of the barrel spring and the force of the bolt driving spring. (Since the bolt is free, the force of its spring opposes the gun motion.) The counter-recoil motions are determined by essentially the same method previously employed for analyzing the effects of the springs. The effect of this gain in velocity is shown in fig. 3-35 by the line designated as step 2 for the bolt. The effect of the spring constants is determined by using the curvcs designated as step 2 to obtain a first approximation of the gun and bolt travels (curves designated as steps 3 in fig. 3-32). The first approximation of the relative motion between the gun and bolt is obtained by subtracting the gun travel curve of step 3 from the bolt travel curve of step 3. This relative motion curve is used during recoil to determine the effect on the gun of the spring constant for the bolt driving spring. Combining this effect with the effect of the barrel spring on the gun gives the gun velocity curve designated as step 5 in fig. 3-35. Since the change in the velocity curve is so slight, it is not necessary to modify the gun travel curve obtained in step 3. NOTE: Since the gun is moving forward, the effects of the spring constants must be applied opposite to the way they were applied during recoil. (Here, the effect of the spring constant for the barrel spring must be subtracted from the curve obtained in step 2 and the effect of the bolt spring constant must be added.) The validity of this procedure can be demonstrated by examining the equation expressing the change in gun velocity due to the cffect of the barrel spring alone.